What is Barretts Esophagus? Barretts Syndrome and Acid Reflux? Barretts esophagus is an abnormal change in the lining of your esophagus that can lead to esophageal cancer. Barrett's esophagus is named after an english doctor, Norman Barrett. It is found in 1 out of 10 people that have acid reflux. The mucous membrane consists of white tissue. Constant heartburn changes your esophagus into 'stomach-like' tissue with a pink-salmon color. It is as if pink stomach tissue has grown upwards into the esophagus. 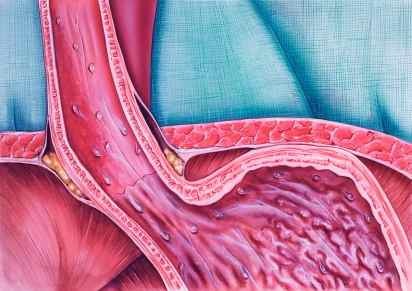 A tight muscular valve, the esophageal sphincter, normally separates stomach and food pipe. Heartburn sufferers, however, have got a muscular valve that doesn't function properly and leaks acid into the esophagus. The erosive action of burning stomach acid, results in a chronic inflammation called reflux esophagitis. Your esophagus reacts by adapting its cells into a more 'stomach-like' tissue. This adaptation presents as a pink-salmon colored esophagus and is called Barrett's Esophagus. Your food pipe tries to protect its tissue from the constant present of burning acid. It becomes more 'stomach-like', by changing its structure. This cell change is called dysplasia. Unfortunately this dysplasia can be the first stage to esophageal cancer. A reassuring fact to know is that of all patients with Barretts esophagus, only 5 percent develop esophageal cancer. If you suffer from chronic heartburn, a gastroscopy should be performed. If your radiologist detects the typical pink-salmon color inside your esophagus, the diagnosis of Barrett's Syndrome can be made. To rule out any presence of cancer cells, your doctor takes samples of tissue (biopsies) during gastroscopy. Every 3 year, an endoscopic check looks for any presence of dysplasia. Remedies for acid reflux or medication are important if you have Barrets Esophagus to prevent acid reflux to occur. Remedies and medication for acid reflux remain important for stopping acid reflux. A gastroscopy is done every 6 months. Radio Frequency Ablation is a new technique that is done during endoscopy. A heated device burns away unhealthy tissue. Fresh, healthy tissue can grow back. Endoscopic surgery removes bad parts of esophageal tissue or uses radio frequency ablation to burn away smaller spots. For patients with locally-advanced esophageal cancer, a combination of chemotherapy and radiation therapy is done before surgery to shrink the tumor. The doctor removes bad tissue and then connects the remaining healthy part of the esophagus to the stomach so that the patient can swallow normally. The stomach or part of the intestine may sometimes be used to make the connection. Lymph nodes are removed during surgery because a tumor might spread via these nodes to the lymphatic system. A tumor that has spread beyond the esophagus and lymph nodes can't be removed anymore. Chemotherapy and radiation therapy help to control the tumor.